Each lavender bush at the La Source Parfumee Gardens near Gourdon village in the Provence, France is tended to daily and kept perfectly manicured. 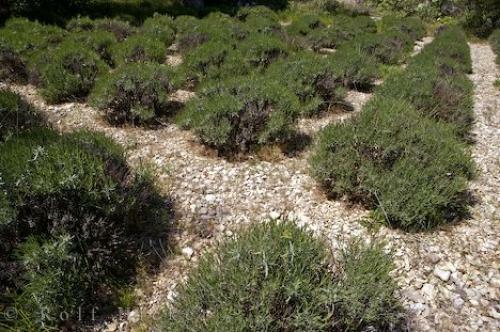 Photo of rows of the lavender bush at the La Source Parfumee gardens in Gourdon, France. ... If you have problems with your gardens, stroll through the the La Source Parfumee Gardens in Gourdon, France and pick up some gardening tips.The lavender bush is a multi-purpose bush and it thrives in the Provence, France as they have an incredible amount of sunshine and fields of open countryside which are ideal growing conditions for this bush.Lavender Bushes at La Source Parfumee Gardens 3 kms from the Village of Gourdon, Alpes Maritimes, Provence, France, Europe. I photographed this photo with the digital SLR camera model Canon EOS-1Ds Mark II, aperture of f/14.0, exposure time of 1/40 sec. on ISO 100, as always I used a original Canon Lens, the focus lenght for this picture was 24mm.